Scribo Displays offer you high quality forecourt banners which are available in two sizes. 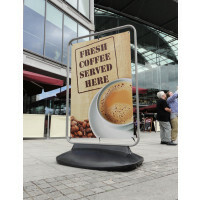 These forecourt banners are ideal for setting displays outside coffee shops, and other retail stores. They have steel frames with silver anodized finish, are also available in custom colours and have water-fillable polyethylene base (made using recycled materials). The water-fillable bases are normally available in Black colour to hide dirt and marks, or in custom colours according to the customers' preferences. The polyethylene bases of these forecourt banners are equipped with built-in wheels for easy movement, along with our purpose-designed trolleys and sets of elastic banner ties. Go through our range of high-quality forecourt banners to choose the ones that meet your specifications.